Moving on from the bike itself that we discussed in the last few shows, this episode we’re talking about the rider and what to wear whilst you’re on the trail. Clothing is one area that many new riders can find hard to figure out, so we’re here to talk through the options and get you in the right gear from the off. We think that the right clothing for your style of riding is one of the most important parts of a comfortable and enjoyable ride, so it’s something you’ll want to make sure is on point. Everyone wants to look the part too, right? In this second clothing episode, we talk about everything you might wear on the lower part of your body when riding, including your shorts (or trousers in the winter), your socks and of course, your all-important footwear. One of the most important parts of your riding gear will be your shorts, so it’s important to get these right from the get-go. In terms of style, there are really two options. The first is baggy gear, whether these are regular shorts, long trousers or somewhere in between, like the 3/4 length Endura Humvees. Baggy gear has a lot of benefits for us MTBers and the first of these is style. Baggy gear has a more laid-back and relaxed vibe than lycra and looks at home on a bike with wide, knobbly tyres and plenty of suspension. It does however have some more practical uses too. Baggy gear allows for plenty of pockets, allowing you to carry things like a phone, food and small tools really easily. Your other option is tights, such as lycra shorts or longs. These are my (Tom’s) choice of clothing being a racer and a performance-orientated cyclist. Tights will look good when paired with appropriate additional clothing, but definitely out of place mixed in with baggy upper body gear. They’re very functional when it comes to riding a bike, and don’t get heavy and cumbersome in muddy and wet weather, which is great for us here in the UK. We discuss both of these options more in the show itself. You’d be excused for thinking there isn’t much to talk about when it comes to socks, but they can be more technical that first meets the eye. Socks can have a big impact on your riding comfort and there are quite a few differences between a basic sock, a summer riding sock and even more so, one designed for winter. So first of all, proper riding socks are designed to fit your foot well. They’ll often have an elasticated arch, which helps keep the sock in place when riding and stops the sock bunching up inside your shoe, which can cause painful pressure-points on long rides. They’ll also feature a longer cuff than a running or regular sock too, helping them stay up on the leg and stopping debris getting inside. We also discuss winter socks on the show and admit that our experience with them hasn’t been all that great. Even though there are many socks on the market touted as waterproof, myself and Colin have always found that our feet inevitably end up in a pool of water inside our shoes. Dedicated winter socks will keep your feet warmer though, and on those damp days, will help keep your feet dry, so we do recommend getting a few pairs for when the cold weather returns. We’ve gone into detail about riding footwear in the show before, but it was worth coming back to for this guide to clothing. Your footwear is critically important for both riding comfort, but also performance, and it can sometimes take a while for beginners to switch to MTB-specific equipment. Like with your legwear, there are two main choices in terms of footwear types, and it will depend on your pedal system. These are of course flat pedals and clipless pedals. We start by discussing flat pedals on the show. Colin is a big fan of FiveTen shoes, and recommends them to anyone using flats. They come with a super-tacky sole to help them stick to the pedals and lots of other key features that make them perfect for riding in. Have a listen to the show to hear his full run-down. We then close out the episode by talking clipless-specific shoes, where I mention some of their benefits and the features that a prospective buyer should be looking out for. These include a rigid sole for maximum power transfer, a secure fitting system like a ratchet or Velcro straps, as well as a solid toe box. I use Shimano shoes and can’t recommend them enough for comfort and function. What’s in your riding wardrobe? We always want to hear about your experiences and what equipment you use when out on the bike. Let us know about the gear that you’d recommend to fellow riders and which pieces of clothing you rely on the most. You can get in touch via the website or tweet us, where Colin is @colinmcgray and I can be found at @bytombell on Twitter. We’ll see you on the next show, where we’ll be answering some of your questions as best we can! Great show today boys! I especially liked the delve in to Tom’s semi-pro career. It was very entertaining and enlightening. 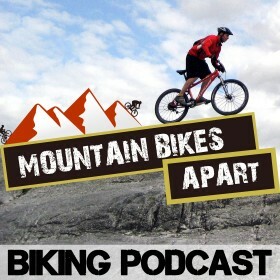 I think that a weekly update of all that is happening on the Pro MTB scene would be a fantastic addition to your podcast/website. Just to follow-up on the discussion about the professional MTB coverage, I must say I am a keen follower of the international XC and Downhill events. It is exciting stuff! As Tom says in this episode, Red Bull TV do great coverage of it all. The events go out live at UTC time and can always be found afterwards on demand. I don’t work for Red Bull or anything like that, I’m just a big fan of their output, a big MTB nut, and I thought that your readers/listeners might be interested.